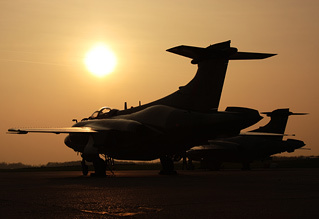 The Buccaneer Aviation Group (TBAG) organised a unique event at their Bruntingthorpe home to celebrate the completion of the epic restoration to running order of their Buccaneer S.2 XW544. Steve Buckby was there to see XW544 in her new clothes. Photography by the UKAR Team. 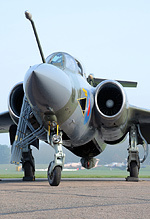 The order of events for the day included the grand unveiling of XW544 herself in her new paint scheme, fast taxi runs down the runway by XW544 singly and in the company of the TBAGs other operational Buccaneer, the 809 NAS schemed XX894 plus The Cold War Jets Collections XX900. 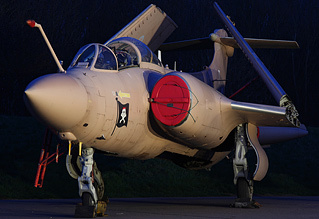 Photo opportunities abounded throughout the day culminating with the taxiable Buccaneers joined by TBAG's third Bucc, the Operation Granby veteran XX889 which were then all illuminated for a night shoot. 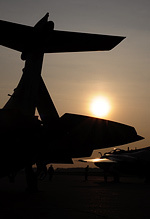 My only criticism is that the aircraft were too close together, but this is only a minor point. The lighting was more than adequate but more would be beneficial. 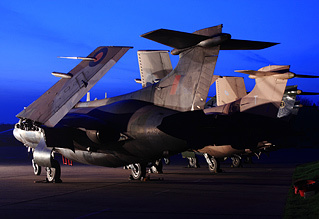 The colour scheme chosen for '544 is her original 1979 RAF Germany dark sea-grey and dark green wrap around camouflage when she was issued to No 16 Sqn based at RAF Laarbruch on the German Dutch border carrying the code 'Oscar' on her tail. The quality and attention to detail of the finish on '544 is superb. A closer inspection reveals that not only have all the correct squadron markings been applied but the myriad of servicing and warning stencils (including some in German as befitting for a RAFG Bucc) that sometimes get missed out on re-paints are all present and correct and in their rightful place. The members of TBAG really must be congratulated on a wonderful job on transforming XW544 from the faded and unloved airframe that sat on its belly under a tarpaulin in a haulage yard on the A53 to the beautifully finished example of the RAFs last British built bomber. The excellent organisation, numerous photo opportunities which were enhanced by an uncluttered background, use of an elevated platform as well as ensuring that no personnel were in the way, accompanied by the beautiful spring sunshine all made for an excellent day out and at only £10 per person great value too. 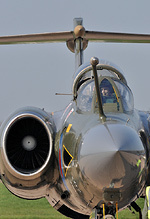 Thank you to all involved in organising the event, aviation days out don't get much better than this.